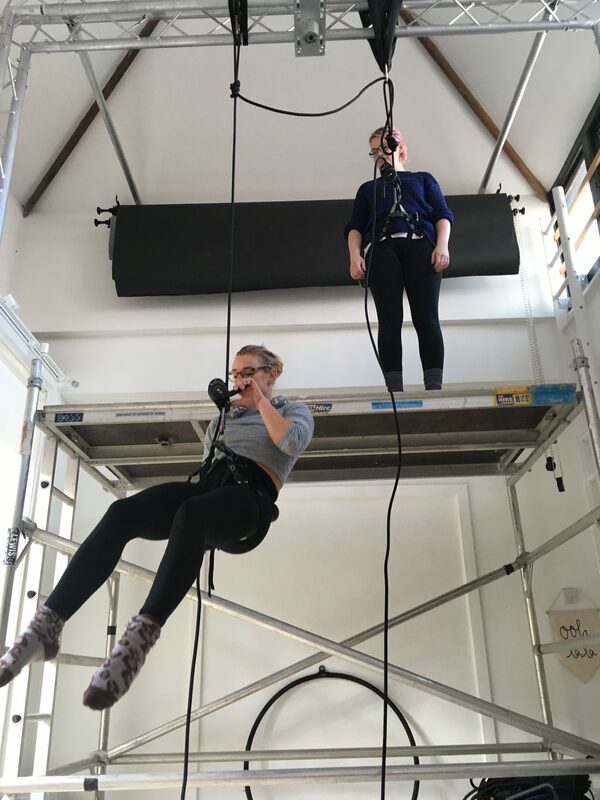 This weekend I have completed a two day course on the fundamentals of rigging for aerial performance delivered by Bryan Donaldson of High Performance Productions. The course comprises theory and practice content comprehensibly put together in a 31 page manual, with the all important load calculations and how to evaluate the different types of dynamic loads we apply on structures and on our equipment; how to select your rigging equipment, the formula for converting the minimum breaking loads into safe working loads, factors of safety; different types of equipment and their uses i.e steel vs alloy; automation; access, legislation and what laws apply to us as aerial performers; all the important acronyms such as SWL, WLL, PPE, WAH, kN, KGF, MBS, LOLER and many more! We have also learnt about working at height and fall arrest and we all got to participate in a practical working at height rescue situation on ropes, which I found most interesting as I got to dust off my old climbing harness which I hadn’t used in years! I got to belay and “rescue” another attendee, Dave, who was double my size! It was incredibly helpful learning to execute all the relevant knots and their applications on aerial activities. We also learnt to splice a wire; connectors such as karabiners, maillons and shackles and their correct use; alignment and inspection; slings and trussing. The most fascinating part of it all however, was applying different dynamic factors onto the aerial performer and seeing the minimum breaking load changing with the swings and beats in Bryan’s load senser screen! I now also know how to put together a proper risk assessment, an area I was definitely lacking on. I can’t recommend this course enough- it has surely changed the way I will approach safety in aerial performance from now on. There is no price on safety and ultimately it is our lives on the line!